I love Thai food but have to admit that whether I'm cooking at home, or if myself and Nicola are going out for dinner, Thai cuisine is rarely on my radar. However after eating at Chaophraya Leeds, I might be changing my thought process in the future. When hospitality website Citylicious heard that myself and Nicola had plans for a long weekend visiting our friend Andrew in Leeds, they got in touch to see if I would be interested in reviewing one of their restaurant clients. As soon as I found out it was Chaophraya, we quickly agreed to help out. 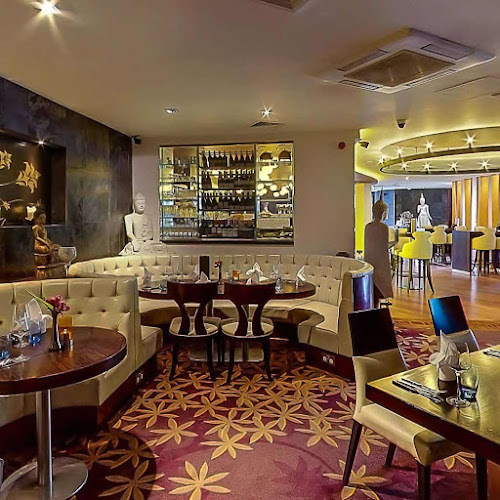 Operated by Thai Leisure Group, Chaophraya Leeds is one of eight Chaophraya restaurants dotted across the UK, three in Scotland and the other five located across England. Myself and Nicola have eaten at Chaophraya Glasgow in the past and had an idea of what to expect from the menu although we had no idea what the restaurant would be like from a design point of view. The Glasgow restaurant is catagorised as a 'traditional, heritage' site and is a stunning example of classy, chic interior design housed in a Grade A listed building, while on the other hand, the Leeds restaurant is catagorised as a 'classic, contemporary' site so we were keen to see how the the two styles compared. It was a cold and wet Yorkshire night when we arrived at the restaurant and as we were a little early for our booking, we had time to relax with a drink from the bar. The drinks menu has a fantastic range of classic cocktails, imported bottled beer, premium spirits and even a few perfect serve Gin and tonics but we all decided to order a selection of Thai inspired cocktails. Nicola started the night with the 'Flower Market', a refreshing shaken cocktail of Aperol, Colonel Fox Gin, elderflower liqueur, lemon juice and vanilla. This drink was a great balance of sweet, sour, bitter and dry with the Aperol adding an amazing depth of flavour. Andrew opted for the oddly named 'Gentleman's Badger', a long drink crafted from Gentleman's Badger sloe gin, mixed with Pimms, ginger ale and lemonade. As cooler style cocktails go, this was delicious, the sloe gin was packed with sweet jammy flavour and a spiciness that worked really well with the herby flavours from the Pimms. Andrew loved his drink, commenting that it would be perfect drink to enjoy on a Summer's evening watching the sun go down. I started the night with the 'Galangal Essence', a wonderful blend of Whitley Neill Gin, vanilla liqueur, galangal root and lemon juice. Whitley Neill is a fantastic gin with tons of spice and citrus zest on the palate - congrats to the bartender who decided to shake it with the spicy galangal, sweet vanilla and sour lemon. It wasn't long before we were shown to our table before spending what seemed like an age trying to decide what to order. 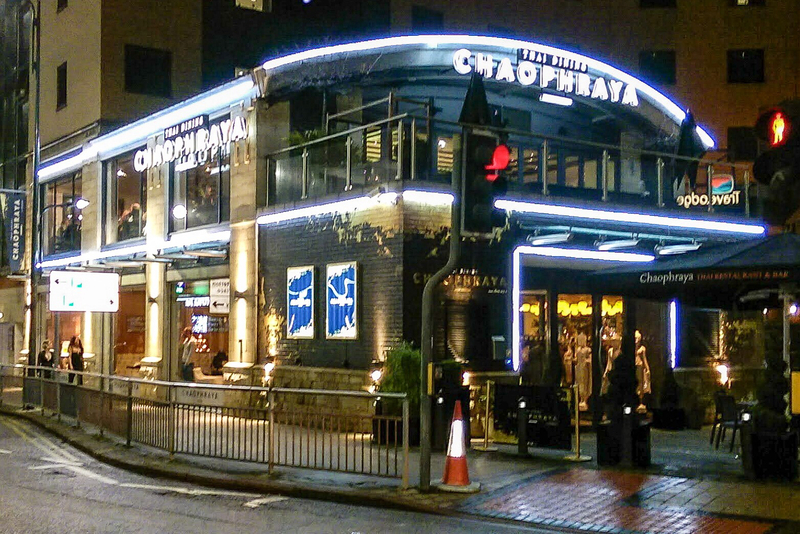 The menu at Chaophraya is extensive, which made it really difficult for us to choose what we wanted to eat! We were so undecided that in the end, we selected one of the starter platters to share between the three of us. The platters offer great value for money, starting from just £9.50 per person, with a good selection of meat and vegetation dishes to whet the appetite. Our Maeklong Platter included chicken satay skewers, prawn & pork dumplings, chicken spring rolls, and sweetcorn cakes, (and for some unknown reason, we also had some Thai chicken tacos too). 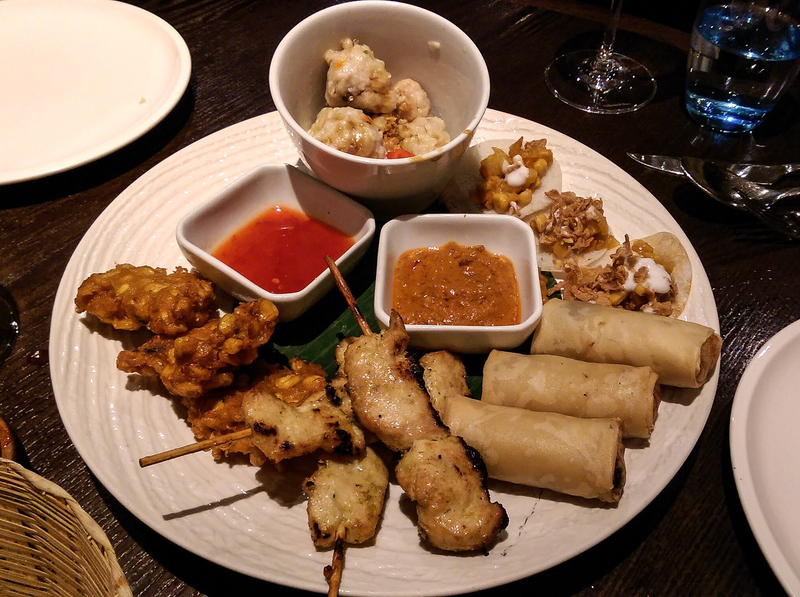 This is the most popular sharing platter on the Chaophraya menu and I can understand why. Everything on the platter was full of flavour and well seasoned. The dumplings were delightful little flour parcels stuffed to bursting with an incredible mix of sweet prawns and seasoned pork mince, this was my favourite starter. Nicola and Andrew both loved the chicken satay skewers which had been chargrilled to perfection and worked with the rich satay sauce. The other starters were equally delicious and I can easily imagine working my way through a Maeklong Platter armed with nothing more than a chilled bottle of Singha Thai beer. Choosing our main dishes wasn't an easy thing to do either but Nicola loves her fried rice dishes and opted for the Spicy Fried-Rice with Chicken and Basil, topped with a fried egg (or star egg). The word spicy should have been a clue as the huge mound of stirfried rice was heavily flavoured with a kick of garlic and packed a ferocious punch of chilli heat but not too much that it was uncomfortable. The spiralised cucumber on the side was clearly there to help cool the mouth, not an over the top garnish. 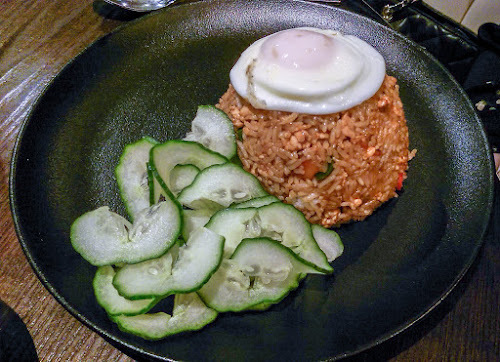 Some restaurants often scrimp on the meat in a fried rice dish but that wasn't the case here as Nicola seemed to have a piece of chicken in every forkful of this street. In the end, the hefty position size, loads of chicken and a well cooked fried egg got the better of Nicola and she threw the towel in. A quick glance at the main courses was all it took for Andrew to plump for the Duck Tamarind and when his dish came to the table, I have to admit to having a little food envy. 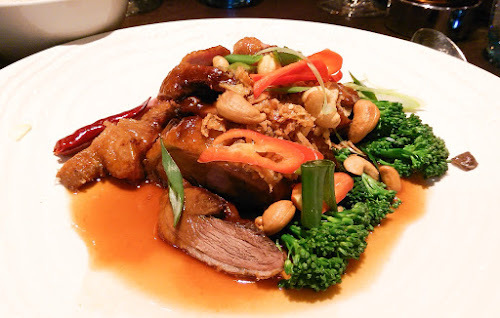 The duck breast had been roasted with palm sugar and tamarind to give a slightly sweet and sour taste but these flavours were balance by the addition of fried shallots, cashew nuts, steamed tenderstem broccoli and the heat of dried chilli flakes. On the plate it looked like an proper tasty Sunday roast dinner but the richness of flavour from the tamarind based sauce lifted this dish to another level. I really struggled to decide what to order. 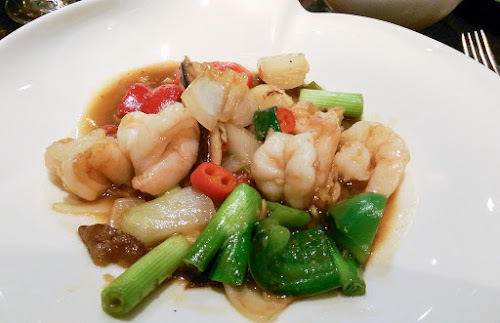 There was a pork belly dish that my eyes kept going back to but when our waiter popped the question, I blurted out that I wanted the Stir-fried King Prawns with Ginger, and I'm glad that I did - it was delicious! There was no shortage of succulent king prawns on the plate which had been tossed in the wok with copious amounts of Thai ginger, shitake mushroom, red pepper, chilli and spring onion. This dish was fragrant, light and fresh, making it very easy for me to clear the plate. Myself and Andrew took our waiter's recommendation on side dishes of rice with Andrew having the sticky rice and myself having the steamed jasmine rice. Both of the rices dishes were huge and had me known the size, we would have shared one portion between us. By this point in the meal we were all stuffed and declined the chance to look over the dessert menu. It was Saturday night and we didn't want to fill ourselves up any more, we had drinking to do so we asked for the bill and made our way outside to the sub-zero temperature to join the hoards of Leeds girls who were braving the elements 'sans coats'. We all had a great night at Chaophraya Leeds and although it is part of a 'chain', the restaurant has its own identity and is very different to our experience in Glasgow. All of the food was fresh and tasted delicious, the portion sizes were generous, and the service was excellent from the minute we walked through the door until the moment we left. All three of us would happily recommend Chaophraya Leeds to anyone living in or visiting Leeds when looking for somewhere to eat. I would like to thank the staff and management at Chaophraya Leeds for their hospitality and generosity on the night. We all had a fantastic night and I know that Andrew has plans to get back again soon. On the night, Nicola and myself dined as guests of the restaurant although we did pay for drinks and Andrew's meal. 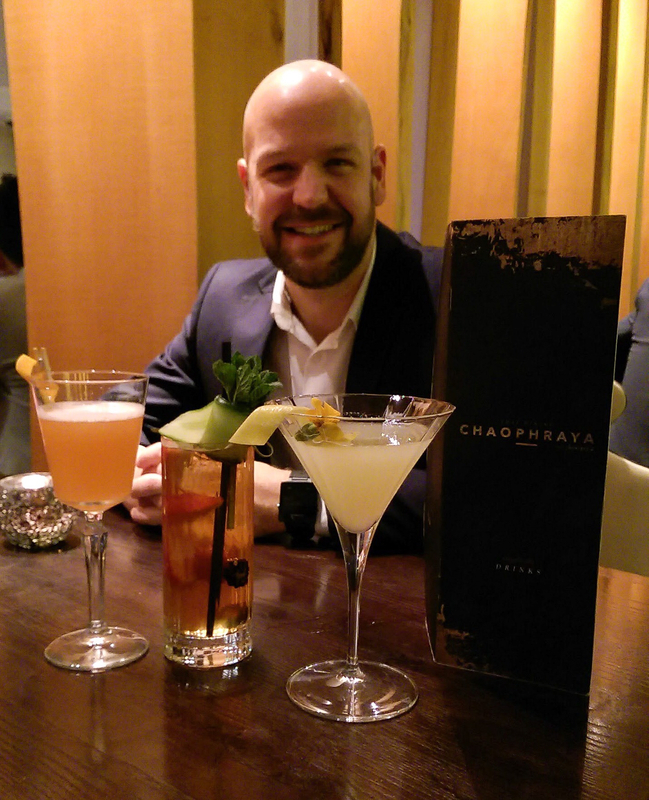 The review above is an honest account of our experience at Chaophraya Leeds. Keep up to date with news from Chaophraya Leeds on Facebook or Twitter and if you fancy getting along for dinner, book a table online here.